If you want to realize your dreams of home ownership but cannot qualify for a traditional mortgage due to bruised credit, a small down payment, you are self-employed or are new to the country – you should be investing your time into educating yourself and our rent to own guide is the best place to start. You CAN still get out of the rental rat race by investing your hard-earned rent money into a rent to own. STOP depositing it into your landlords bank account and start putting it towards a place of your OWN. We SHOW you HOW! The Guide is based on “real people and real life stories“, probably very much like your own situation. We provide you with the foundation so you know what to look for BEFORE you start in a rent to own program. Get the top 16 reasons why rent to own WILL work for you even though you think you are a lost cause. Worried about being scammed? We give you 6 signs to watch for so you don’t get scammed! Get the top 20 questions you SHOULD ask of any company or person you are considering doing a rent to own with. Know what we know. 18 rules so you succeed including what contracts you SHOULD be signing. Readability: Conversational language, easy to read. Technicality: Contains introductory and advanced material with specific examples. Provides Practical, How To Knowledge On: All the things you need to consider and learn before you even decide to use rent to own to get into home ownership, as well as specifics on who would qualify for rent to own, how to succeed, how to qualify for a mortgage and worksheets to help get your financial health back in order. Summary: Rent to Own: A New Path to Homeownership contains fabulous, practical information on the rent to own process. They explain the good, the bad and the problems that can arise with the numerous rent to own and zero down schemes marketed by supposed real estate gurus, and gives you the no-nonsense truth about what it takes to be successful with rent to own. This guide provides very practical knowledge that will help you if you are interested in rent to own to avoid the typical mistakes. It teaches you through real life examples to objectively evaluate a rent to own opportunity- and in order to find a good deal – you will need knowledge, patience and be willing to do research. One of the best things about this guide is the chapter that discusses the contracts involved in a rent to own. It is almost impossible to get the truth about contracts online, yes, there are plenty of bits and pieces but this guide puts it all together in one very easy, digestible chapter. Did you know that having two contracts in place provides the best security? I didn’t until I read this guide but have heard that many rent to owns are created without two contracts. This chapter tells you why you should have two contracts which is very important for your security and your success. Find out what you have to look for, and what to look out for. Downside: Rent to Own: A New Path to Homeownership gives you the real world, practical steps you must take to be successful at rent to own. One complaint I do have is that there were no specific samples of the contracts discussed in the guide. There was very detailed information on how what the contracts should contain and what they should hypothetically look like, but they did not support the information with real life samples. Might seem like a petty complaint but I would have liked to have had a chance to review the language used in the discussed agreements. Listen, if you are looking for the pep rally type book filled with fluff and no substance, or you already think you know everything there is to know about rent to own, than you won’t like this guide. On the flip side, if you admit to not knowing everything about rent to own and really want to learn how to succeed, then you will benefit from the information in this guide. A definite recommend if you are considering rent-to-own! Want the skinny on Rent to Own? The Essential Guide for Homebuyers is a fantastic introduction to the subject. Rent to Own is virtual unknown for many people but it will soon be a topic that anyone wanting into home ownership but can’t qualify for a mortgage should be researching. This Guide provides the big picture. There is no beating around the bush and it examines real life stories that make the content even easier to digest. Written for “any” person looking for an alternative to renting, the Essential Guide for Homebuyers puts Rent to Own in perspective and lays out a plan anyone can follow to succeed and get into home ownership. What it doesn’t do is promise to hand hold people through the process because like anything in life, there is still hard work involved to succeed. 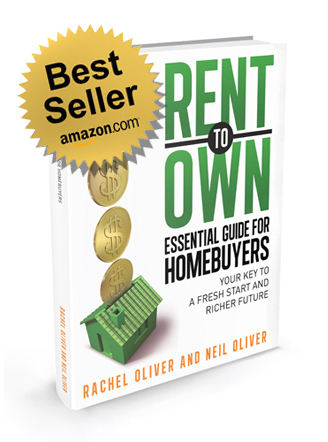 If you are serious about Rent to Own, this Guide needs to be your first research stop. Understanding the nuances around Rent to Own is a big hurdle and win for many people and this Guide tells it like it is. Reading this Guide will give you a much better grasp of what’s involved in a Rent to Own program and how to protect yourself through education. Well done! When we first sat with Rachel Oliver to discuss the prospect of becoming involved in the Rent-To-Own side of real estate, my husband Craig and I delivered to her an enormous amount of questions – all of which Rachel met with professionalism and intelligence. Neil Oliver also spent a great deal of time with us walking through the logistics and legalese of the Rent-To-Own industry. In our journey to acquire the guidance we needed in order to make the best decision for ourselves, we both agreed that Rachel and Neil were indeed the experts that we were seeking in facilitating our future endeavors as Investors in RTOs. Not only are Rachel and Neil highly qualified and extremely knowledgeable, they are both kind and care about the future of both the Tenant-Buyer and Investor. Those attributes are precisely what Craig and I deemed necessary for the people that we entrust with our own well-being. We are sincerely thankful to have found Rachel and Neil Oliver and are grateful for all their direction. This is a great guide for anyone who is looking to learn about the rent to own strategy. It goes into great detail about what to look for, what to avoid, and a hundred other things you have to keep in mind when you start in a rent to own. The amount of detail in here is very good written by two experts in the rent to own field. I have met Neil for a one on one consultation as well and can truthfully say that he is just as genuine in person and they really do just want to help people get on the path to home ownership. I would highly recommend this book to anybody interested in doing a rent to own. Loved the fresh advice on rent to own and smart tips on how to actually succeed at it. Most rto people are so desperate to get you into their program but very few actually take the time (or care) to show the steps needed to succeed. Due to a divorce and the impact it had on my credit, my options for owning my own home have become slim so picking up this book and researching rent to own was a no-brainer for me. It’s a good feeling to read a book and hear that other people are enjoying successes in rent to own. The authors are generous in their advice and provide great tips on how to position yourself for a better future. This book will definitely give you a leg up if you are looking at rent to own as an option to get you into home ownership. Thank you Rachel and Neil Oliver for this much needed reference guide for home-buyers! As a realtor, I am grateful for your good works that can and will help the dream of home ownership real and attainable for many. I’ve enjoyed the read, engaging, well written and precise. Excited that I can recommend and share with those I meet along my path, making a difference in our world, my dream! I can say wholeheartedly that I am ecstatic that I have found Rachel and Neil Oliver. I first met them at one of their seminars and was immediately impressed with their focus on putting the best interests of their clients first. In speaking to them afterwards, I found that they walk the walk and live to make other people’s lives better. They are on a mission to do that and anyone who encounters them testifies to the same thing. I read their book “Rent To Own Essential Guide for Home buyers: Your Key to a Fresh Start and Richer Future”. I was astonished by how thorough they were at giving away their personal recipe on how everything works. This showed me that they are all about giving their clients full disclosure so they can be fully informed to make the best decision. They have brought in many third party experts – such as mortgage brokers, realtors, myself (Financial, Insurance, Debt, Credit repair) etc. – to verify what they say and to help the client’s chances of success. In fact the book invites all who read it to critique it, showing that they have absolutely nothing to hide. That is a testimony in itself. The confidence i now have from the support from Rachel and Neil has led me to invest in my first Rent To Own property. I am completely thrilled and appreciate the constant support that i have received. I highly recommend this book. I am an absolute beginner when it comes to rent to own. This book gave me practical information and advice on Rent To Own. I was super skeptical about Rent To Own in the first place and I never really understood it until I read this book. This book is terrific. The authors are a very humble, down-to-earth and have a willingness to share their successes and they even tell you what to avoid. The authors know their stuff when it comes to Rent To Own and made me understand how powerful Rent To Own really is. If you want to stop renting and start getting on the road to becoming a home owner then this book is really for you. I really liked this book – I have heard about the rent to own concept, but did not know much about how it actually works. This book explains the concept using many examples and scenarios, and even more – shows the pros and cons of the concept. I did not feel the authors try to convince me I have to do it, but rather help me figure out if it would work for me and my family. There’s a lot of great tips what to look for, how to protect yourself from a potential scam and get to your goal of home owning sooner than you may thought possible. Highly recommend this book to anyone who wants a good reason to stop renting. This is a great book. It explains the concept of Rent to Own in a concise way and enabled me to have a whole new understanding of what Rent to Own actually is. I enjoyed the examples, scenarios, pros and cons but most importantly thought the tips on how to protect yourself and what to look for provided so much value. I recommend this book to people who want to stop renting and to people that want a clear picture on how rent to own works.